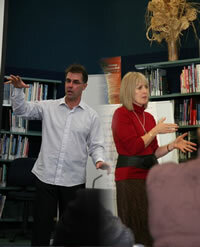 Ron and Kath in 2010 published the following article: Developing a restorative school culture: The blending of a personal and professional 'pilgrimage'. Breakdown in teacher-student relationships is causing disenchantment with educational settings, from pre-school to tertiary level, and lack of student engagement and achievement. Rather than blame being attributed to either teachers or students this training seeks to; assist relationships by working with problems in a collaborative and positive manner and; ensure that systems and pathways support both parties and include the wider educational community where appropriate. Growing better relationships within communities gives hope and a sense of belonging to its members. A restorative approach to solving problems within communities can transform conflict and build better community relations to enable members to work together to achieve desired outcomes. Developing a Restorative Philosophy in the workplace is concerned with strengthening relationships within the organisation to increase job satisfaction, productivity and the emotional well-being of all members. The name of this business “Pilgrim Practices” denotes the ‘journey’ required to move both personal and community-wide philosophy forward so that there is a societal recommitment to the importance of relationships, and to upholding practices that restore relationships that have been damaged. “...Respectful dialogue is ultimately the only peace building option that we have, and so we all need to learn increasingly effective ways of working towards peaceful co-existence”Drewery & Winslade 2005.